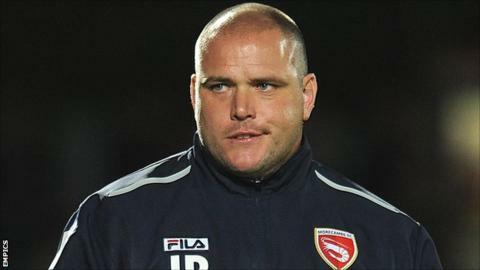 Manager Jim Bentley says Morecambe have deserved more points from their home fixtures after ending their seven-month wait for a victory on home soil. was the first time the Shrimps had won at the Globe Arena since 6 March. "We've played some decent stuff of late and it [the home win] was a long time coming but we got the result to match our performance," said Bentley. "I don't think anyone could dispute that we were worthy winners." Away from home in League Two, the Shrimps have picked up impressive wins at Exeter and Bristol Rovers. But they had only collected one point at home before their success against the Spireites. "We were the better side against Port Vale and got done in the 89th minute," Bentley told BBC Radio Lancashire. "Against York, we created the better chances to win, and there was nothing in the Fleetwood game until three mistakes cost us and we took a bit of drubbing. "We were 2-0 up against Plymouth and should have closed the game out, so that was definitely a game we shouldn't have lost. "I know it's a results business, but as a manager I've got to look through the results and see how we've been playing."